Don’t let his work on Sinestro fool you; Geoff Johns is the master of Green Lantern. 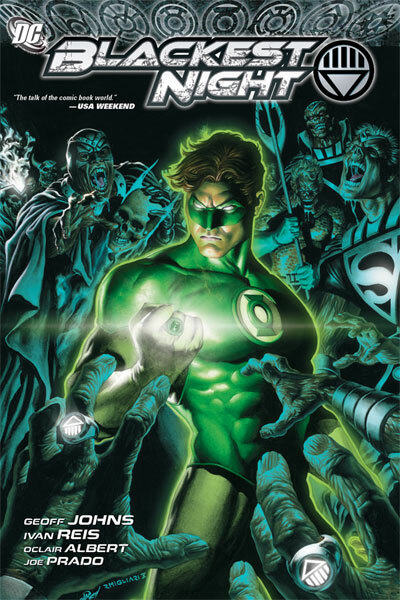 His groundbreaking arc, starting with 2005’s Green Lantern: Rebirth, has been a breath of fresh air for the character and has solidified his place in my heart as my second-favourite superhero of all time (behind the obvious first-place). His pre-New 52 finale War of the Green Lanterns was a brutal, engrossing action-adventure story with a bitter (but not unsatisfying) ending. His inclusion of eight new colour-coded Corps has forever altered the dynamic of future Lantern stories. In short, Geoff Johns has made a big Green Lantern-shaped splash. One of the waves of that splash was Blackest Night, DC’s crossover event for 2009 that featured almost every corner of the universe fighting Lantern-powered zombies. Seriously. That alone was enough to sell it to me. The story was written as an entire-company crossover for DC, but centrally it’s a Lantern story. Resident funeral director William Hand has acquired the power to raise the dead as ringslingin’, heart-eating Black Lanterns in the wake of Bruce Wayne’s death. Using this power he brings back long-dead heroes and villains of DC’s decades-long continuity who then begin chewing their victim’s ventricles and the scenery. I’m not going to go too far into the story for the sake of those who’ve not seen it, but this is a masterpiece. It’s an example of a company crossover done well, with character deaths having just the right impact and the plot twists not coming across as gimmicky contrivances. If you decide to expand your reading into the additional material then there are longer-lasting impacts of said deaths and twists that extend further into series you wouldn’t think related to a bunch of grey-skinned alien zombies with more teeth than a Sarlacc wedding. The story sounds a bit pedestrian the way I’m describing it, but it’s a raw, emotional journey with a lot of good popcorn action moments, some great character development (mainly for the Lantern characters) and a lot of really heartfelt, poignant moments that resonate throughout the story and give it emotional heart. It’s got elements of horror, tragedy and romance all rolled into a big ball of awesome. I’m only skimping on content because there are some epic twists – especially when you get to the latter half of the narrative – that, if you haven’t had them spoiled yet, come off as really excellent WHAM moments. Like that bit where Hal and Atrocitus make out. I know. Total WHAM. The artwork is handled by longtime Johns collaborator Ivan Reis and it is, in a word, gorgeous. There’s a great balance between the fleshed-out tones of realistic human portrayal and the bright, larger than life colours of the varied Lantern Corps, the existing DC superheroes and the clash between them and the Black Lantern army. The Black Lanterns themselves are depicted as grotesque parodies of the characters they once were – including a quite memorable appearance by former Elongated Man Ralph Dibny who now looks like something not out of place in a Lovecraft novel. The dialogue is one of the best, shining examples of what Johns can pull of with realistic dialogue sticking to fantastic characters – it strongly evokes what Brian Bendis did for Dark Avengers in that conversational, normal dialogue takes an organic place in a world of magic and superpowers. As always Hal Jordan is on hand for the odd one-liner or quip that never fails to make one giggle, and when you’ve got characters like Larfleeze on hand with his trademark cry of “MINE!” it gives a dark, gritty story a lot of mirth and good-natured fun as well. It’s a marriage of writing between the serious and the snarky that is pulled off most excellently. You could really do a lot worse than checking out Blackest Night – whilst my recommendation of it is brief, it is nonetheless one of the best examples of the superhero comic book subgenre I’ve ever experienced. It’ll probably carry a lot more weight if you’ve read the books beforehand (see here for the list of relevant titles) but it’s still a good, fun ride even if you haven’t. So that brings us to Number 1. The best. My favourite. What I consider to be the most awesome comic book in the history of ever. Anyone wanna guess what it is? Anyone? Yeah, I figured you all knew already. I’ve telegraphed and proclaimed it for many years now, so it ain’t surprising you’d all know what it was before I reviewed it. It’s totally Cry for Justice.